The T3 is approximately one-third smaller and a few grams lighter (if you include the harnesses). The T3 supports (temporary) signal "suppression" during a multiple burial. The T3 senses motion before auto-reverting from search to transmit. The T3 is now user-updatable via a mini USB port! Searching: The Tracker3 indicates direction with five LED arrows (versus round lights on the Tracker2). As with its two predecessors, the Tracker3's direction indicator updates quickly. The Tracker3's inline reception range is statistically identical to the Tracker2. And as with the Tracker2, the Tracker3's reception range when held perpendicular to the transmitting beacon is noticeably shorter than other transceivers. Although the Tracker3 has a suggested search strip width of 50 meters (and the user's manual conflictingly says, "no more than 40 meters"), you should use a shorter search strip width with Tracker avalanche transceivers. Multiple Burials: The Tracker3 is the first Tracker to "suppress" (aka, "mark") a transceiver during a multiple burial search. BCA took a different approach than most of the other manufactures: the Tracker3 marks only one transceiver and only for one minute. When the T3 senses two transmitters, it blinks two little people. If it senses more than two transmitters, a plus sign ("+") appears to the right of the people. If there are two transmitters within six meters of the searching T3, brackets ("[ ]") surround the people (that's an indication they are close together). Pressing the "Options" button until "SS" appears (for signal suppression) instructs the T3 to ignore the strongest signal and direct you to the second strongest signal. If you continue to hold the button pressed the T3 will instead switch into the "big picture" mode. When the strongest signal is being suppressed, the people alternatingly blink (far from intuitive, but memorable). The signal suppression mode lasts for only one minute, and then you'll be directed to whichever signal is strongest, possibly back to the first signal if you haven't made much progress toward the second (e.g., difficult travel terrain, widely spaced victims, etc). This approach to a multiple burial is significantly different from most of the other transceivers which can display up to three (or more) transmitters, can suppress multiple transmitters, and can graphically display which transmitters have been suppressed (e.g., by drawing a line through each person). Such ambitious features don't work perfectly all of the time; BCA's focus on a more limited design for only two closely buried victims might be more reliable. In our testing of a close-proximity burial of only two victims, the T3 worked very well. More than two closely buried victims and the edge goes to the competition. Learn more about searching for multiple victims. Big Picture: The T3 also has a "big picture" mode that is activated by holding the Options button pressed. In this mode the transceiver alternatingly displays the distance and direction information of all of the signals it is receiving. For example, alternating between "straight-ahead 12 meters" and "hard-right 8 meters." This is very helpful and well implemented (although we wish they'd used the more common term, "scan"). The Ortovox S1+, Pulse, Pieps, and some ARVAs also have the ability to display information on more than one transceiver at a time, mostly without directional information, but the Tracker3's implementation is simple and arguably the best scan feature available. The Tracker3 user manual states that the "Big Picture mode is the closest thing to an analog beacon in the digital world." It is a great feature, undeniably, but that statement overlooks the fact that even in the digital world, some beacons can be toggled into analog mode and can emit the raw analog audio. Spikes: The Tracker3 has three antennas. In limited testing, the Tracker3 resolved spikes well. Revert to Transmit: As with the Tracker2, you can instruct the Tracker3 to automatically switch from receive mode to transmit mode and as with the Tracker2, this mode needs to be selected each time you power-up the Tracker (by holding the Options button pressed until "Ar" is displayed). When enabled, the Tracker3 "reverts" after one minute without motion or five minutes with motion (the Tracker2 reverts after eight minutes regardless of motion). The Tracker3 won't revert without warning—the beeping begins 30 seconds before reverting and a loud warning continues indefinitely. I really like the continued beeping, because if a transceive is placed on the ground (heaven forbid) and reverts, somebody will notice it. The weights of the T2 and T3 are within grams if you include the harnesses—without the harnesses the T3 is 20% lighter. Controls: The Tracker3 uses a single dial to change between Off, Transmit, and Search. You need to slide a small latch with your other hand to change between modes. These actions are intuitive, although they're not nearly as mitten-friendly as most other beacons—including the Tracker2. The new dial is darn-near impossible to manipulate with bulky gloves or mittens. The Tracker3 has a single, unlabeled "Options" button. It, too, is difficult to manage while wearing bulky gloves. A quick press of this button while searching changes to signal suppression mode, pressing and holding the button changes to the big picture mode, pressing and holding while switching to search mode mutes the speakers, pressing and holding the button when turning the device on displays the version number (and activates the revert-to-transmit mode if you keep it pressed). Memorizable? Yes. Intuitive? No way. We find the single-button design found on the Neo and DSPs, labeled with an obvious flag, to be much easier for novices to master. Audio: Prior to the version 3.3 software update, the Tracker3 had a distinctive, "Super Mario" sound. The startup and shutdown sounds are still spacey, but the search audio is now similar to the Tracker2. Click the Play button to hear the pre-3.3 audio. The Tracker3 emits several tones when it changes from Search to Send. That's convenient, so you don't mistakenly return to Sending. The Tracker3 emits reminder beeps after 30 minutes in search mode and after 12 hours in transmit mode. Display: The Tracker3 retains the two-digit display found on earlier Trackers. That's a shame, because you'll need to remember that "LO" means the speaker has been turned off (not to "low"), that "Lb" means the battery is low, that "Ar" means auto-reverting has been enabled, that "TR" means it's transmitting, that "BP" means big picture, that "SS" means signal suppression, and that "SE" means searching. And the block-like font makes this even more difficult, because it is difficult at first glance to know if the "b" in "Lb" is a "b" or a "6" and whether "SS" are two letters or the number 55. Competing transceivers can show zigzags during the Signal search, a four-headed-arrow during the fine search, a battery to indicate remaining battery life, flags to indicate that a transceiver has been marked, etc. When the Tracker DTS was released in 1997 it undeniably surpassed the competition in ease-of-use. The Tracker3 no longer retains that distinction. Comfort: The Tracker3's harness is made from untailored 1-inch webbing. It's a bit scratchy on your neck compared to other harnesses, including the contoured-and-ventilated Pieps harness. The T3 is secured in its pouch with a large, a glove-friendly Fastex buckle. The coiled leash is novel, although not as novel as the DSP's elastic cord which is integrated into the shoulder strap. Conclusion: The Tracker3 feels like equal steps forward and backward. The signal suppression, although limited, seems very functional. Displaying two people when there are multiple transmitters versus illuminating a light, displaying directional arrows rather than round lights, and the slim housing are also improvements. And we really like the scan "big picture" mode. However, the small on/transmit/search dial, the (subjectively) quirky sounds, and the untailored harness feel like steps in the wrong direction. And the display, albeit an improvement over the Tracker2, is not state of the art. 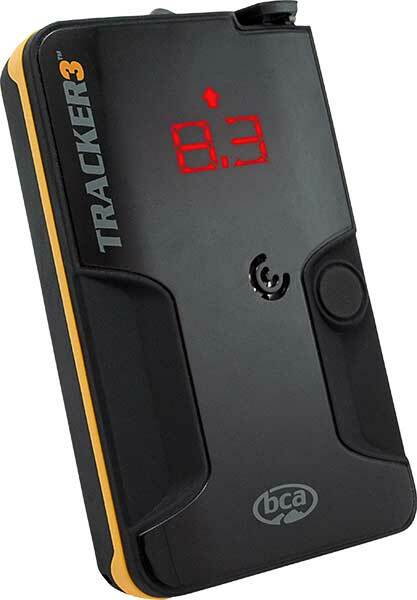 In February 2016, BCA released software that allows users to update the Tracker3. The Tracker3 screen is easily scratched... Treat it carefully. Cons: Two-digit display, not mitten friendly, shorter perpendicular reception range, can mark only one transmitter and only for one minute.